The duo met at CSU in Wagga Wagga when Simone was studying graphic design and Mariusz was studying information technology. After graduating in 2001, they stayed in touch and a few years later identified a need for busy consumers to skip the cue by ordering ahead of time, and for cafe owners to tap into the market of time-poor patrons opting not to order in the traditional way. The result? 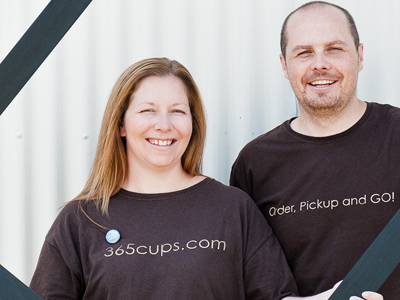 Mobile app 365cups, which went live in 2011 and now has clients in Australia, New Zealand, the United States and throughout Asia. More than 440,000 food and beverage items have been ordered through the 365cups system, generating close to $3M in revenue for Simone and Mariusz’s clients. The pair is now branching out to create apps for buildings, ordering systems for nursing homes, and a ‘free cuppa’ app as a road safety initiative for the NSW Government’s Roads and Maritime Services (RMS). Here, ‘appreneurs’ Simone and Mariusz give an insight into their world. We both chose CSU because...we wanted out of Sydney. We wanted a completely new experience and came to uni as mature age students in our 20s). The best experience at CSU...was the friends we both made. At university...we were inspired to have long lasting careers. Today we’re motivated to...build our business. In this profession...it’s important to be innovative and agile. We never dreamed we would...travel the world and tour Silicon Valley because of our business. Why are you passionate about what you do? I love tech (Mariusz) and I love people (Simone) so it never feels like “work”. The topics we Tweet about most are... coffee, tech and apps (@365cups). One last thing... Just start. Whatever it is you want to do – start. NOW!